Warcraft III Bot Hosting for just €2,99 per month! Welcome to GHostPanel.net, the place for affordable Warcraft III bot hosting. 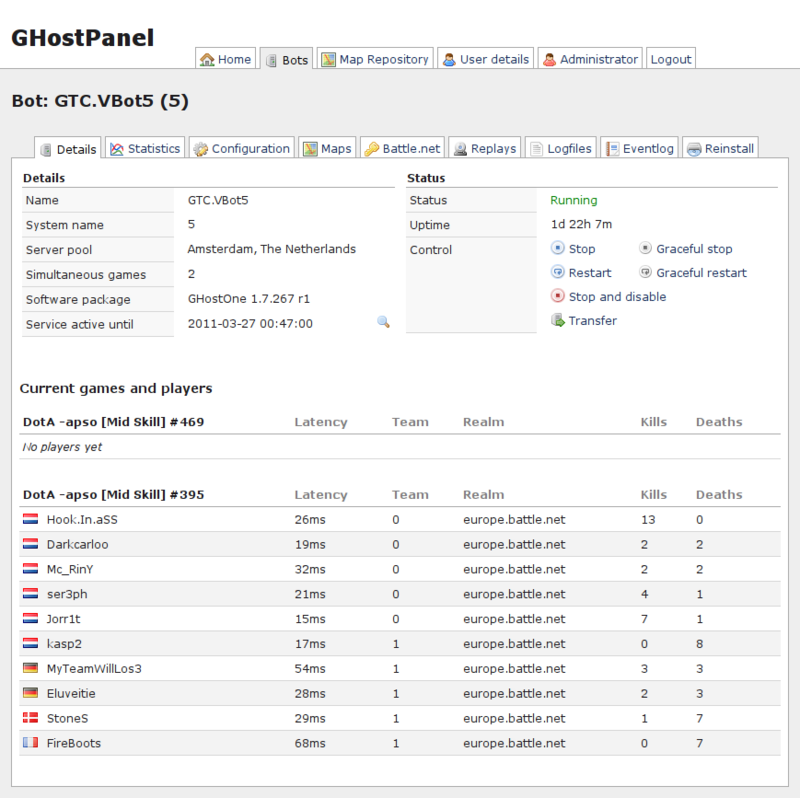 At GHostPanel.net you can rent your own Warcraft III game hosting bot, we are offering a full featured control panel with our bots for easy management. You can choose between GHost++, GHostCB and GHostOne and one of our servers in Amsterdam (Europe), New York and Los Angeles (United States). Moving your bots to GHostPanel.net? We will be happy to help you, we can also help converting your database to MySQL at GHostPanel and import your bans. One week free trial available! The bot list will give you direct insight into the servers you are running. You also immediately see what the status of the server is. GHostPanel gives you complete control over the state of your bot. 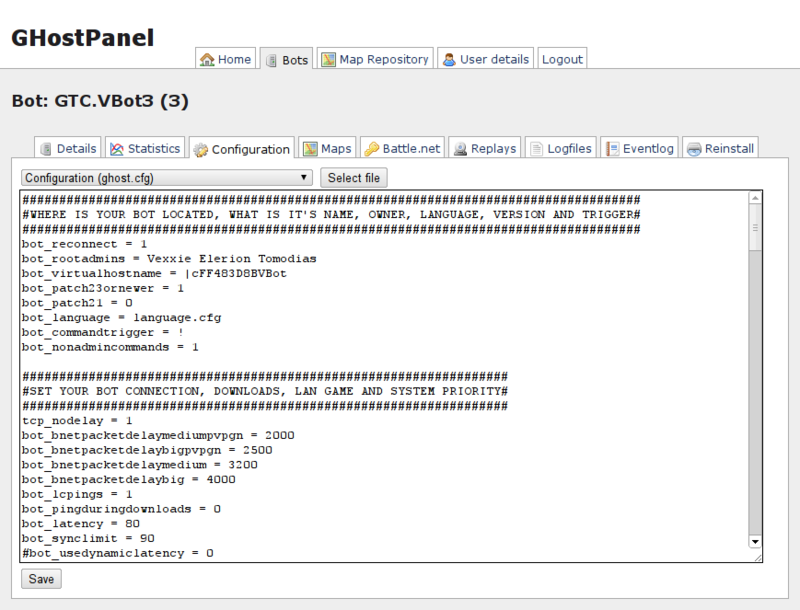 Actions executed in the control panel are sent directly to the GHostPanel node and the status will change immediately. Using the 'graceful'-actions it's possible to restart or stop a bot after all running games are finished. You never have to wonder again which games are running and which players are playing on your bot. 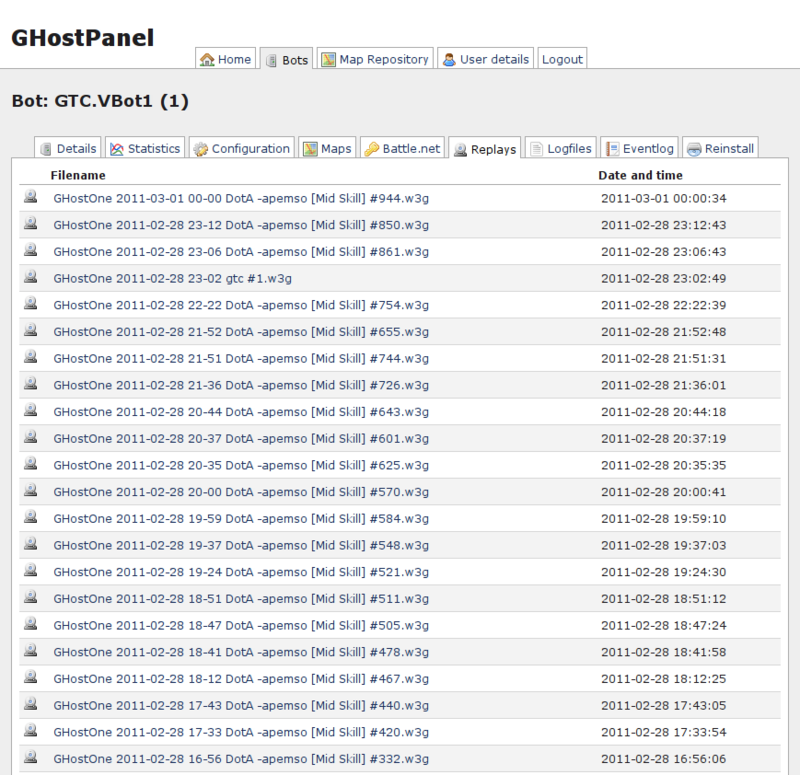 Thru GHostPanel you will get direct insight into the currently running games and the players playing on your bot. Other useful information such as country of origin (based on the player's IP-address), network latency and DotA score is also available. 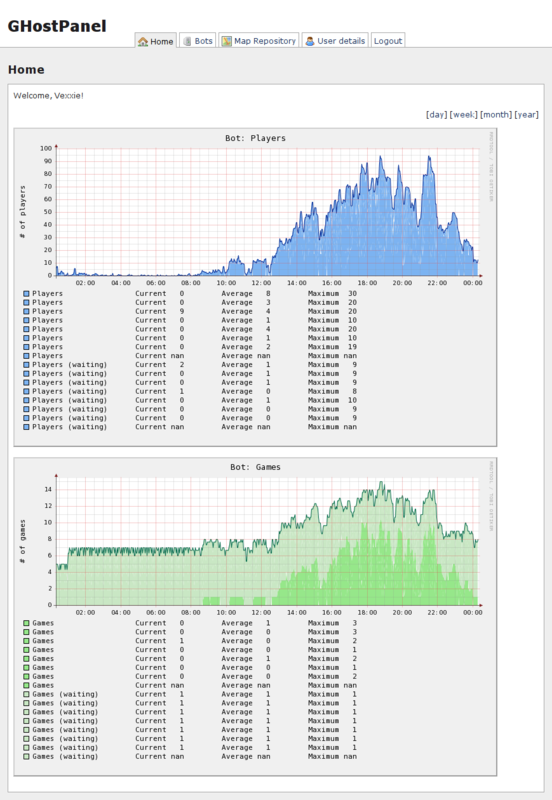 Our statistics give you a historical view of your bots displayed as graphs. These graphs will show you the number of games and players in the past year and thus show you the increase or decrease in games and players. It will also show you what time of the day your bot is most active. Changing your bot's configuration is done directly through GHostPanel and is as easy as submitting a web form. Changes are directly saved in the configuration file which is saved with your bot. Changing the welcome and game over messages (and others) can be done the same way. 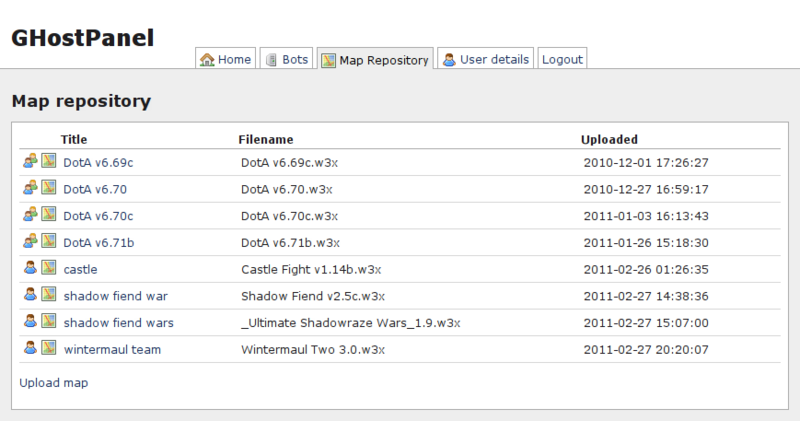 We maintain a Warcraft III map repository, using the map repository you can add a map to your bot in just a few clicks. Ofcourse it's also possible to upload maps of your own, after uploading your map it can be placed on one of your bots just as easily. The Battle.net connection manager gives you full control over the Battle.net network your bot will connect to. 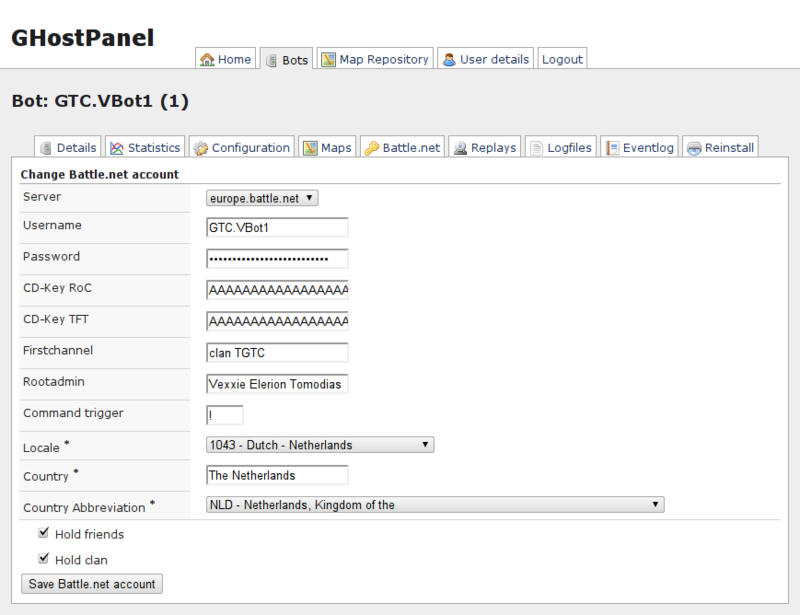 Besides the Battle.net server, username and password we give you the option to configure the bot locale and country. This way you can aim your bot at a specific part of the world. On request we can provide your bot with RoC and TFT keys. Our bots keep a seperate log file for each game, just like a replay is being created for each game. Every log file and replay will be available at GHostPanel as soon as the game has finished. We will keep your log files and replays available for 2 weeks after which they are deleted. For questions, trial requests and to order your bot: . We offer our bots at different locations around the globe. The following map will give you the locations, status and availability where we currently offering bot hosting. We are still expanding and trying out other locations to expand to. If you want to participate in a beta test (yellow markers) please send us an e-mail and describe how you plan to use your bot. You can also suggest other locations to expand to, just send us an e-mail!